As a cycle coach one of the most common questions I get asked by parents of young children is, “What is the quickest way to get my child to learn to ride a bike?” my immediate and unwavering response is get them a balance bike. 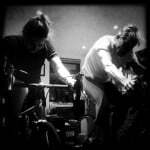 Both of my children learnt on them as young as two, and by the time they were three they were pedalling without ever having used stabilisers and were joining us on cycling trips into the Cairngorms. The concept of the balance bike has been around for centuries and the design dates back to the early velocipede created by the German Karl Drais, called a Laufmaschine, where the rider would sit on the saddle and propel the bike by walking his feet along the ground. Looking at drawings of Drais’s machine, it is difficult to see much difference in design to modern balance bikes, but then why change something that clearly works. The fine art of balancing is the fundamental key for anyone who wants to pedal a two-wheeled bike, but most training methods for young riders give them the experience of riding a bike, but take away any need to learn to balance, hence the inevitable difficulty when the training wheels are removed and the hard part of cycling has to be learnt from scratch. Balance bikes teach the child to propel themselves forward, using their feet, meanwhile finding a comfortable position on the bike. As their confidence progresses they can lift their feet for as little or as long as they want and let the bike roll along. For the very young rider this can take longer, but the fun is in the learning. For parents it can be a liberating experience. When my wife and I went for dog walks in the woods we normally wouldn’t have been able to go far pushing buggies, but with my daughter at four pedalling like she’d ridden for decades and my boy, just turned two, scooting along on his balance bike, we were able to walk for a couple of hours without a grumble of discontent from our two young wheelers who happily rode through puddles and up and over bumpy ground. Even in a world of TV and computerised games the sheer joy for a child when they learn to ride a bike means a whole new world of discovery and adventure opens out before them, and with a balance bike these possibilities start to open, but it is when the child has mastered the act of balance that the fun starts. On many occasions I’ve seen children that have learnt to balance, put down their balance bike and straight away pick up a pedal bike and go; it was that easy. For my own two, it took a few minutes, five at the most to get to grips with the pedals, but it still wasn’t long before they were hurtling down the dirt track beside our house, whooping with delight. For many of you reading this however, you may have already gone to the expense of buying a bike with pedals and you don’t want to spend more money on buying a balance bike; the simple answer is take the pedals off and “voila”, you have a balance bike. 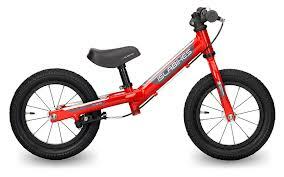 More manufacturers are adding balance bikes into their children’s range and the choice available is ever widening. For me the key factor is to keep it simple on the bike, if a child is too distracted by other bits and pieces on the bike then they will take longer to learn to balance. Whichever bike you choose it is a good idea, where possible to try out the bike first, but in general balance bikes are so basic that you can’t really go wrong as long as you have the right size. Minimum inside leg measurement – This will dictate the child’s ability to sit on the saddle and touch the ground with their feet, also known as “step-over height”. 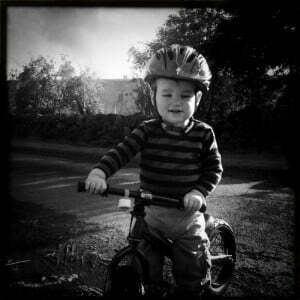 The lower the measurement, the more suitable the bike is for younger children, or those with shorter legs. 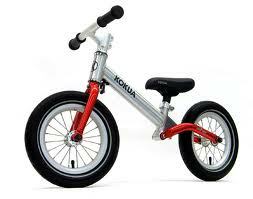 Most of the bikes have adjustable seat heights that allow the saddle to be raised as your child grows. Rear Brake – Some balance bikes don’t have a brake, which means the rider has less to think about as they learn, but as they grow in confidence and speed a brake is recommended. Some balance bikes that don’t come fitted with a brake have an option to buy the brake as required. 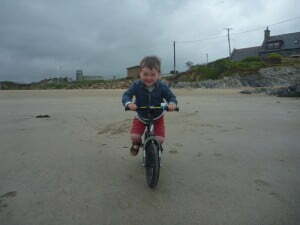 My own two children learnt without a brake until they got a pedal bike. I feel it helped with perception and control of speed, but their mother wasn’t convinced when the soles of their shoes wore out. Steering limiter – Most of the balance bikes will come with a steering limiter that prevents the handlebars turning 360 degrees. These can limit the full steering motion and avoid the handlebars being turned at an acute angle and thus causing a fall. Tyres – Pneumatic tyres will take more maintenance and upkeep, but are easy to replace and repair as required. Puncture proof tyres will be more durable and may be a selling point for parents with no mechanical expertise. The Strider offers a light frame without a back brake which means the rider has to control their speed using their feet, which means one less thing for them to think about when they are learning; on the downside, as they gain confidence and speed, this can wear shoes out quickly. The manufacturers offer an optional friction plate brake that is operated by using the foot to press the plate against the rear tyre. My reservation of this system is that the child is learning a braking system that will differ from the handlebar mounted brakes on their next bike. 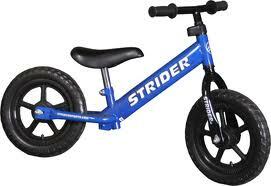 The Strider also has footplates on the rear stays that allow the rider to stand up as they roll. The moulded foam tyres are virtually maintenance free and are puncture proof and lastly there is no steering limiter that the manufacturers claim allows the child to learn about setting their own steering limits through rider input. Made in Germany by Kokua, the original Like a Bike was designed by Rolf Mertens in 1997 and he is credited as being the originator of the “new-wave” of balance bikes now on the market. Very similar to the “hobby horse of years gone by, the “Like a Bike is made of wood. It’s a beautiful object to look at and of all the bikes reviewed here it has the lowest stand over height, meaning that even this should fit even the smallest of riders, however the adjustment, as the saddle is put up is limited to 4 set heights, although a height extension post is available to accommodate a further 3cm of stand over height. Interestingly, unlike the Strider, the Like a Bike has a steering limiter that Kokua claim avoids potential jack-knife crashes. The full range of Like a Bike wooden bikes offers a multitude of choices including, spoked and disc wheeled bikes, “the racer”, that has skinnier wheels and the “Wing” that has integrated footrests. The Like a Bike is at the top end of the balance bike price range, but for those who like something to look a bit different the design of this bike certainly makes it stand out. The “Jumper” comes from the same stable as the wooden “Like a Bike”, but with a higher step over height it is suitable for older riders. 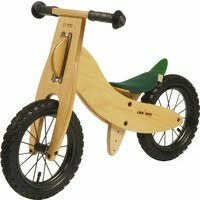 The design, with the exception of the wooden frame “forest” is similar to many other balance bikes here, with one big exception, the Jumper has rear suspension. Whether you feel that a balance bike has the need for suspension or not is another matter, it is certainly a selling point that might attract both parents and children alike. My own opinion is that a rider, who has progressed to the point of skill that they required suspension, would be ready to progress onto a pedal bike. It has the highest step-over height of all the bikes here, so is certainly aimed at an older rider. Built for Kokua by folding bike specialists Dahon, the Jumper is certainly of a high quality build and looks great and has built in footrests. The Scoot is another great looking bike with a wide range of colours to suit the tastes of even the most choosy child. One feature on this bike that doesn’t appear on any other bike looked at here is the “carry-grip” on the saddle, which is ideal for parents when they have to carry the bike when their child doesn’t want to ride.